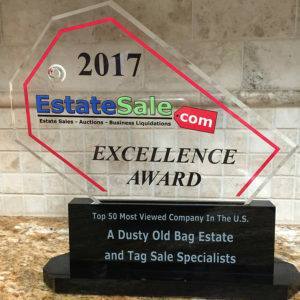 When searching the Internet to find a company that handles estate sales, I happened upon “A Dusty Old Bag” and took time to review the website’s upcoming events section. Then, after reading others’ testimonials I decided to call to schedule an appointment. 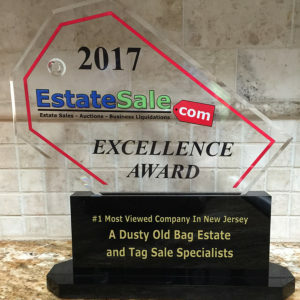 Now, I, too, am pleased to share my experience with others about having hired Lin and Bill of “A Dusty Old Bag” to handle our recent sale in which they liquidated as much of the contents of the house/garage as they said they would be able to do. Upon meeting Lin, I felt completely at ease and knew that I had made the right decision to contact her. She is easy-going and down-to-earth, and both she and Bill are very knowledgeable about how to derive the most from someone else’s no-longer-needed-but-still-usable possessions. Lin took her time to view all the considerable number of items and offer her advice before saying she would be able to conduct the extensive sale. I signed the contract with a deep sense that I would have no worries and the burdensome task of the sale was going to be handled by the right person. And then, when she and Bill and their awesome “set up team” arrived to organize everything for the sale, I was further impressed at how well they worked together in a short amount of time to have things arranged as there were many items in boxes and bags. The sale was held over two days (Friday/Saturday) and when it concluded, I was extremely pleased at how well Lin and Bill and their “sale days team” accomplished the task. Making the decision to hire “A Dusty Old Bag” for this daunting job was the right thing to do. It proved to be rewarding in many ways: I met a wonderful couple whose expertise helped me immeasurably; many of the “vintage” items I and my family saved thinking they could become someone else’s treasure, turned out to be the case; I didn’t have to barter with folks when selling our relatives’ possessions; and, the profit was beyond my expectations. Thanks Lin and Bill … you two are the best! Loved working with Lin, Bill & their whole team. All were professional, respectful and kind in our dealings with them. Our estate was multifaceted, with tools, farm equipment, antiques and household goods. Everything was handled very capably with little or no stress for me and excellent results of the sale. My highest compliments on Dusty Old Bags’ communication with us, experience and honesty. My father was a hobbyist, loved history and Americana, lived alone and… his home was full of stuff. Stuff that mattered deeply to me, but mostly stuff. couldn’t have moved on without them. Lin and Bill were trustworthy, reliable and comfortable folks with whom to work. If you are looking for the people to tackle a tough job, who care, are realistic and “down to earth” – choose A Dusty Old Bag. Hi Lin-I was so impressed by your professionalism and honesty that I just had to write you a note. I am going to take your advice and sign up with those websites you shared and have a “do it myself” type of sale. You could have easily pressured me to sign up and not share info to educate me-and yet you were so very open as to how the whole process works and what a client would need in order to make a sale worthwhile. I so appreciate that I met you. I told my mother and father about you and our talk and they wished they could have met you. I hope you are blessed with good health and happiness in the years ahead on behalf of your kindness towards families like mine. I wish there were more people like you in business-I would love to work with someone like you. I know for sure ethical business owners are far and few between as I have been looking for part time work and I have turned down several offers as I could tell that the person was not a business person with heart like you! If you’re selling an estate or downsizing, these are the people to use. Lin and Bill are great to work with and relieve any anxiety you may have. They organize, research, and oversee every aspect of the sale and make sure they are fully staffed on sale days to get the job done right. They are also careful to handle your or a loved one’s possessions with care and respect. They are extremely knowledgeable about pricing and bring a wealth of experience with them. The videos and photos are well organized and reflect what prospective buyers can expect at the home. And, while they run the sale, they work with you through every phase, consulting and listening to suggestions. They are also accessible, promptly returning calls and letting you know if there is anything that requires special attention. They can even suggest people to help clear out a home, if necessary, after a sale is completed. Lin and Bill came very highly recommended and lived up to their reputation. We recommend them wholeheartedly. I write this email as a personal thank you and a testimonial to making my estate sale process easy, profitable and dare I say, fun? I especially appreciate your business savvy and your direct approach to getting the job done in the best way possible. You delivered on every promise you made. And, most of all, I appreciate you sharing your vast knowledge with me and expecting nothing in return except for mutual happiness and positive results. Thank you again. I wish you and your family all the best and anytime you need a reference, do not hesitate to give my name out. It would be my pleasure, especially to be able to help other families in need! sell the contents of their home. Linda is knowledgeable and gives a realistic, estimated assessment value on both furniture, housewares, and personal items. She is honest and reliable. We highly recommend Linda and her staff to come to your home and help you sell your treasured items. Linda will provide a safe and secure estate or content sale setting for your home. The prospect of downsizing from our five bedroom home to an already furnished FL home was daunting and keeping me awake at night! The entire process became streamlined once I contacted Lin and Bill. From our initial meeting, we were confident they would get the job done and I enjoyed a solid night’s sleep for a change! Lin and Bill are consummate professionals and bring with them a team of enthusiastic and friendly workers. My husband and I were amazed at how much of our stuff sold, our end profit, and the fact that it was accomplished while we spent the sales days enjoying each other’s company visiting some favorite sights. We highly recommend The Dusty Old Bag without reservation. A Dusty Old Bag estate sales came to me very highly recommended. I felt at ease with Lin the first time we spoke. She was honest and wanted to actually see the estate before agreeing to do our sale. Lin and Bill did an amazing job and they are both very knowledgeable about pricing!! Lin kept me involved with the preparation of the sale and the sale itself even though I lived out of state. I would highly recommend them to anyone needing help with getting rid of an estate or downsizing. They are simply the best and I wish they worked outside of New Jersey! Dear Lin, it was such a pleasure to work with you on my recent estate sale. You were wonderful, caring, and efficient. You took care of everything from start to finish and made my transition to my new home so much easier because of this. The results you realized on my behalf were far and above my highest expectations! 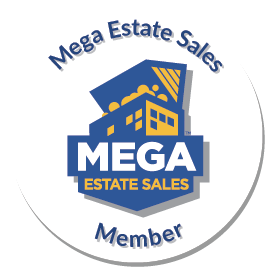 Thank you so much and I highly recommend anyone looking for a professional and caring person to handle the sale of their estate belongings to consider you FIRST! It’s been a day, now, since the completion of our house sale. We moved from a larger house to a smaller apartment and knew we couldn’t take everything with us. I reviewed several ‘house sale’ experts and decided on a “Dusty Old Bag” after I spoke with Lin for the first time. I was impressed by the fact that she wouldn’t simply take our job over the phone, but rather wanted to do an onsite visit – to make sure the contents to be sold made sense — in other words, she didn’t want to take a job on, that might be too small to satisfy her or her customer. I really appreciated that! Lin and Bill were consummate professionals – they showed up when they said they would; they did what they said they would and they were a delight to work with! Bill even spent an afternoon with me, as we sold our dining room set prior to the sale — he wanted to be there when the buyers showed up and didn’t leave until after the buyers had figures out how to get everything in the van they brought! I would recommend Lin and Bill, without reservation, for anyone that needs an estate or house sale professional. Honest, trustworthy and they definitely know their business! And, I found their prices to be very reasonable, besides. Thank you, Lin and Bill – it was a pleasure working with you. We so appreciate all of your efforts on our behalf….and are delighted with the outcome of the sale! We had a huge estate sale to conduct that more than one estate sale professional opted to not take. Lin was clear and concise about what she could do, how long she would need to prepare the house for the sale, and how her company operates. Throughout the entire process from signing the contract to the final sale, Lin is accessible and straightforward. No miscommunications and always available to address any questions or concerns. She and her team worked very hard and did a great job. We were especially impressed with her marketing efforts which really seemed to pay dividends when the sale occurred. From beginning to end, I could not have asked for a more trustworthy, reliable and effective team. 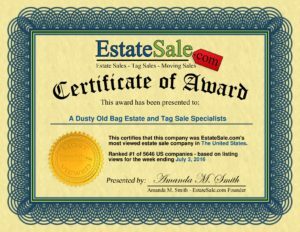 I interviewed several Estate Sale Professionals before choosing A Dusty Old Bag. There was just something SPECIAL about Lin the day I met her. Bill said, “Just let me do my thing” while he set up items for sale and when I saw how he staged the house, I knew I had made the right decision. They delivered more than promised and kept me in the loop as the sale progressed when there were bids offered. I have already given their cards out to several friends that are thinking of downsizing. It was such a pleasure meeting and working with them. It was bittersweet selling my home after 34 years, but time to go and they made the process so much easier. Thanks Lin & Bill, I’ll keep in touch. “With humor, compassion, knowledge and hard work, Lin proved invaluable in ensuring all of our objectives were accomplished in quickly and efficiently selling, at reasonable prices, all of our home’s contents before its sale. We appreciate her support and would strongly recommend her services to anyone looking to achieve the most from their estate, move & tag or garage sale. My brother and I would like to express our gratitude to Lin and Bill for helping us sell the contents of my dad’s home. My dad was a clutter keeper and there was a tremendous amount of work to be done. From the initial visit with Lin I felt comfortable that her and her team would be able to handle the task of organizing and selling many of the items dad had saved for so many years. There were countless hours spent preparing for the sale. When issues arose Lin handed them promptly and effectively. Bill even fixed a step going down to the basement to insure that customers would be safe. Lin advertised an extra day so my brother and I could man the sale to sell remaining items. After doing this for one day I realized how difficult estate selling really is. Lin and her team are worth every penny! 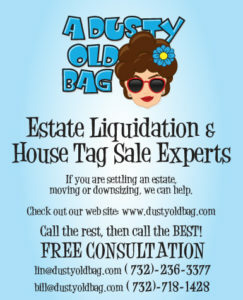 I highly recommend Dusty Old Bag to anyone planning an estate sale. Clearing out my mother’s home was a daunting prospect. Finding Lynn was a godsend. Our February sale went smoothly and professionally, and we were surprised at how many “smalls” sold. We did not attend the sale, as Lynn advised that it could be too emotional, freeing us to enjoy our weekend. At the end of the sale, she helped advice us of agencies that could come and remove the rest of the items. We have found that Re-store of habitat for humanity, is willing pick up most of the remaining furniture. It is wonderful to know my mother’s items can still be useful. Thank you, Lin, for taking on a burden that I dreaded and making it far less painful. Remember, I love to organize! Call if you are up in Sussex County and need a hand! Can we help you and your family? Please contact A Dusty Old Bag. Copyright © 2019 A Dusty Old Bag. All rights reserved.